Discussion in 'Games In Development' started by Archeia, Apr 30, 2014.
and uncover some hidden truths along the way (although you wish you hadn't). Welcome to WHITE SPACE. 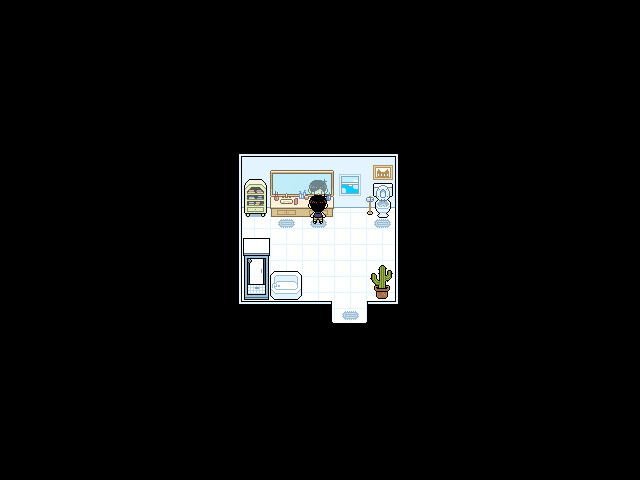 Your name is OMORI and you've been living here for as long as you can remember. Everything is bright white; there aren't any walls. A black lightbulb hangs from the ceiling… wherever it is. There's a floor but it's always cold. The warmest thing here is probably your laptop. You don't mind though. You have a blanket, a laptop, a cat, a sketchbook, and a tissue box. You have everything you need. You are usually upset. Everyone annoys you, you think you are ugly, you don't know where you came from, you don't know where you are going, and you're too tired to care. On good days, your neighbors invite you over for a visit. "How can they have fun with someone as horrible as me?" You miss them now. When will they come again? Maybe today will be a good day! Or maybe today is a day for sleeping. But...Sometimes you're reminded you used to have another friend-- someone really important. Somewhere in the back of your head, you have an inkling feeling that you weren't always like this. You weren't always living in WHITE SPACE. Your story is already over. You just have to remember it. OMOCAT is an illustrator known for a variety of work that ranges from very personal art and comics (Pretty Boy!!) to fanart of various video games and anime to some kickass shirt and crewneck designs. Aside from being an artist, she runs her own online store and is currently working on OMORI (this), a project that has been on her mind since the start of her career. PEDRO SILVA is a musician and, as soon as this project comes to fruition, a composer from San Juan Bautista, CA. Their main project "Slime Girls" combines the feelings of an eternal summer seen only through your TV screen with earnest punk rock energy and heavy influence from various eras of J-Pop. With OMORI, that same emphasis on affecting vibes and lilting emotions you can't quite place will be presented not through the lens of pop music but through the unique medium that only a video game can provide. Drawing from a lifelong influence of VGM always close to the heart, together with OMOCAT's impassioned vision and Jami's ability to synthesize sentiment into song, they hope to create an experience you'll treasure. JAMI CARIGNAN (Heads Up! Hot Dogs, Wonder Momo: Typhoon Booster) is a composer and performing musician from Los Angeles, CA. As their performing artist persona, “Space Boyfriend”, Jami blends pop music with the emotional imperfection of punk rock and Japanese silver-age idol music to create an experience that pushes forward into the future with the ideals of youth and hope. Drawing inspiration from games like EarthBound/MOTHER, Animal Crossing, Persona, and Umihara Kawase, Jami, along with Pedro, hopes to express an earnest and sentimental connection with the themes of OMORI to create an unforgettable and lastingly meaningful experience with the help of your heart. ARCHEIA programs. OMORI is in good hands. She would also like to thank Yami, Galv, Modern Algebra and, Fomar for withstanding her barrage of questions. DIRECTED, WRITTEN, and ILLUSTRATED by the artist OMOCAT. ORIGINAL SOUNDTRACK by SLIME GIRLS and SPACE BOYFRIEND. 8+ DUNGEONS to explore and 60+ UNIQUE NPCs to meet and get to know. THE JUKEBOX QUEST (A side-quest where the player can collect tracks from different musicians/bands to play in the Jukebox at Gino's Diner). Ability to choose your gender and name every member of your party. A traditional turn-based battle system with untraditional statuses and states based off real human emotions and conditions. A bunch of (un)necessary detail. A room full of cats. Jeremiah Eastman, Nightblade50, StoryBook and 20 others like this. Looks like another hit game is on our hands! Question, if Kelsey gets hit for 48 damage by that jet enemy, will the HP bar slowly deplete to zero, or will it go straight to zero and she gets incapacitated? If it's the former, I suggest bigger damage affects the speed of depletion. Since 48 isn't that far from 32, the bar would deplete slowly. At 100 damage, the bar would drop twice as fast, and at 999 damage, the bar would deplete almost instantly. If it's the latter, that doesn't fit the Earthbound/Mother 2 or Mother 3 style that the battle screen suggests to me. Finally, here it is!!!! Wohoooo...congrats for the big success Nessy! 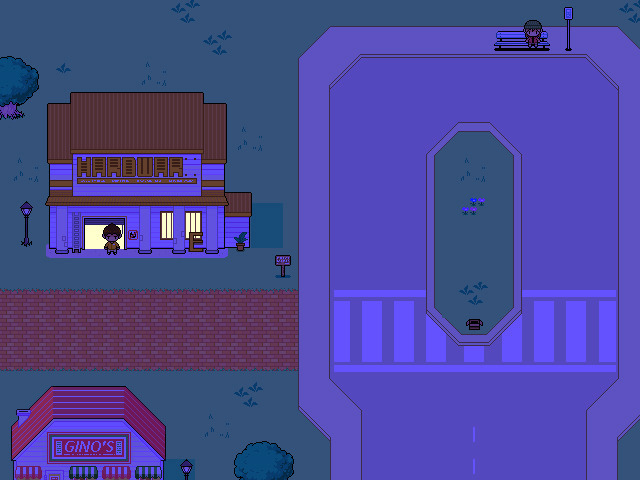 I'm so much into this game, I love everything that resembles Yume Nikki and Mother in some way. Pawsome, this will be so purrfect...beclaws you guys clearly have a lot of tailent! Please paw-don me for the clawful cat puns. Susan and Archeia like this. The trailer looks awesome, I have to admit that while I don't usually like horror games this one has been stuck in my head all day for some reason. Hmm. Question. What is each person in charge of? I'd imagine just by looking at it, omocat is the visual inspiration, drawing most of the tilesets and writing the story. 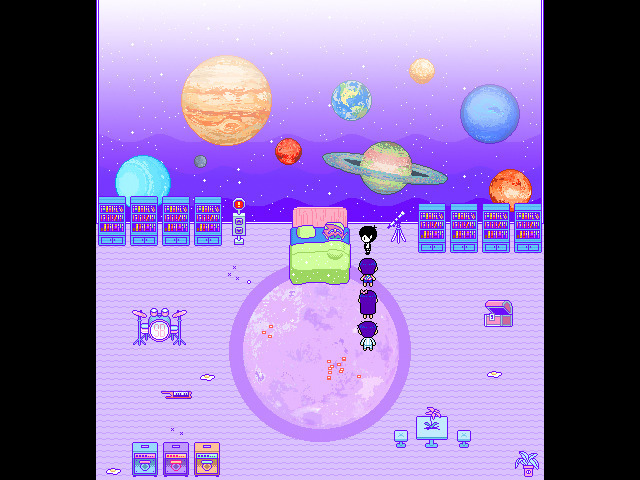 Perhaps Archeia may help a little bit with the visual stuff, but mostly be developing the gameplay within the engine as omocat lays out the vision? What surprises me about this game is not only does it place a focus on aesthetics, but it also has a huge focus on music. There's a whole roster of underground chiptune and japan rock musicians being used in this, and I think that's unique for the game. Also, what will gameplay be like? Will it be like Yume Nikki at all? In terms of surreal exploration? Or is that just a comparison that is bound to pop up because it has trippy visuals and it involves walking around? I'm guessing that the battles will be Earthbound-esque, just like the visuals suggest it to be. By the way, there was a visual novel or something wasn't there? Is that available or was that just a sketch that omocat did? It looked really interesting to read... plus I'm really interested to see what the nature of the story and writing will be like! haha i feel like a little weird xD I feel is like a kid game but in same time my head say : NO NO don't let you blind by this appareance! and a full room of cats!? hugh.....i can't resist about that archeia D:! Currently fighting demon hoards for fun. Looks absolutely amazing guys and congrats on getting funded so quickly! That's a record breaking single day. The gameplay is reminiscent of Earthbound and Metal Gear Solid. It has simplistic gameplay and quirky flavor text and sounds just like Earthbound. It's also heavily focused on exploration so you can take the environment all in, just like Earthbound. There are some stealth mechanics applied here and there. 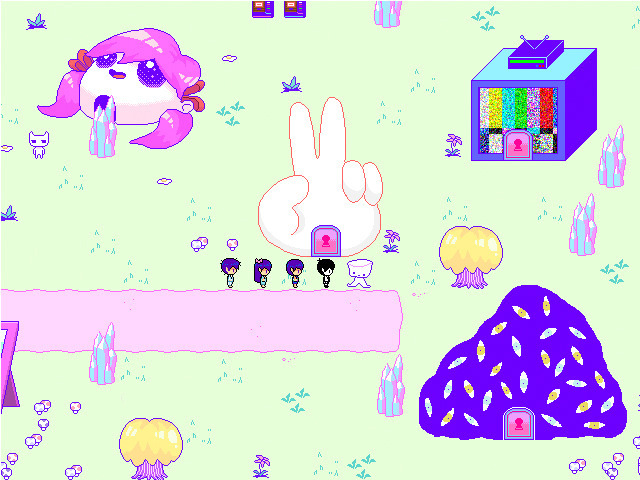 I made a local blog about Omori, here in the forums! We already reached 65k! We're so excited! *watched the trailer... takes off glasses and rubs eyes. * Okay what just happened? I don't know what just happened but it was awesome, can't wait to try this game out, even though I don't know what the hell was happening in that trailer. Oh, so it's like EarthBound on drugs. I'm sold. greensdream and Jonnie91 like this. Dalph, slimmmeiske2 and Stanley like this. Does this project already have too much support for my lil comment to matter? I want all of this. All of this. We finally released a demo for our backers and sadly no public copy yet. Plueschkatze, Lonewulf123 and TWings like this.